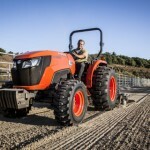 Kubota has expanded its MX-Series utility ag tractor line with the MX5800, a four-wheel-drive HST model delivering 61.4 gross horsepower. The MX5800 meets Tier 4 Final emissions standards and offers increased engine power and ergonomic features for operator comfort. 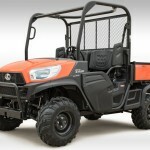 Kubota says the MX5800’s diesel engine provides a smooth transfer of power, low noise and quick starts. A Common Rail System (CRS) and Diesel Particulate Filter (DPF) deliver cleaner emissions that comply with EPA Tier 4 Final emission regulations, and electronic common rail direct fuel injection maximizes fuel economy. 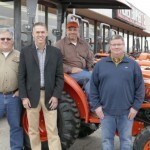 The MX5800 features hydraulic servo HST systems that increase pedal responsiveness and shifting ease regardless of load size, reducing vibration and fatigue to improve tractor performance and operator comfort. 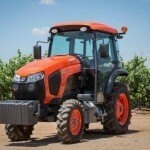 The MX5800 comes equipped with easy-turn hydrostatic power steering, and a touch-and-turn electric PTO switch is positioned to the right side of the console for convenient operation with a push and turn start. The suspension seat on the MX5800 is designed to reduce operator fatigue after a long day’s work. 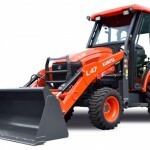 Kubota says the flat deck enables safe and easy mounting and dismounting, with 30 inches of space between fenders. In addition, the hanging pedals optimize leg room. Additional comfort features include a cup holder, behind-the-seat toolbox, and newly designed LCD dash panel with large, easy-to-read gauges. 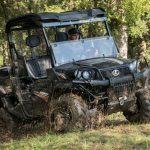 The MX5800 also features a larger fuel tank with 13.5-gallon capacity for longer, more productive operation, with fewer stops to fill up. Finally, the one-piece slanted hood of the MX5800 increases the operator’s field of view and is made of steel.